Bangalore-based PathShodh Healthcare, a startup at the Entrepreneurship Centre of the Indian Institute of Science, has developed a hand-held device to measure eight vital parameters for diabetes, kidney failure, chronic anaemia, and malnutrition. The device, called anuPath, has been developed by Dr. Vinay Kumar along with Professor Navakanta Bhat of Indian Institute of Science and a friend, Gautam Sharma. According to a recent International Diabetes Federation (IDF) report, diabetes currently affects over 425 million people worldwide, and the figure is expected to reach 629 million by 2045. With 73 million diabetics, India ranks second in the world after China. People with diabetes have an increased risk of developing a number of serious health problems. Consistently high blood glucose levels can lead to serious diseases affecting the heart and blood vessels, eyes, kidneys, nerves and teeth. In addition, people with diabetes also have a higher risk of developing infections, says the IDF report. Currently, anuPath can test for hemoglobin, HbA1C, glycated albumin, blood glucose, serum albumin, microalbuminuria, urine ACR, and urine creatinine. It will be extendable to other markers (glycated albumin, serum creatinine, serum bilirubin, etc.) in the future. It works on a non-enzymatic- and non-antibody-based electrochemical biosensing technology. The measurement is done on electrochemical disposable test strips that contain a membrane infused with patented sensing substances. For each biomarker there is a separate disposable strip. When the user places the required sample on the electrochemical disposable test strip, anuPath detects the electrochemical outcomes and the deciphered results are displayed on the digital monitor within a minute. This enables the patient to get a comprehensive report of the status of the disease, which is essential in disease management. Read full research paper. Three graduates from the Indian Institute of Technology, New Delhi, Ankur Kumar, Kanika Prajatat and Pracheer Dutta have developed a machine that can convert the hardy straw of paddy into a fibrous raw material that can be used by the pulp molding factories to prepare disposable cutlery. In India despite a Supreme Court order, and a government scheme that offers stubble management machines at subsidized rates, farmers continue to burn crop residue after harvest, as they find it cheaper than clearing the crop residue manually or by using machines. The practice is rampant across rice-growing belts as paddy straw is neither a suitable fuel nor can be used as cattle feed. The situation is worse in Punjab and Haryana as the smoke resulting from burning the residue chokes Delhi and envelops the entire northern India with dense toxic smog for weeks. Paddy straw is rich in silica, which slows down its rate of degradation and hence farmers choose to burn it post harvest to make the land reusable faster. The new machine, created by the trio as the first product of their startup Kriya Lab, uses an environment-friendly chemical that can strip the straw of silica, making it supple and usable. The pulp can be used as raw material for the pulp and paper industry. Scientists at the Indian Institute of Technology (IIT)-Roorkee have fabricated low-cost thin film solar cells by extracting the plant pigments from plums, black currants, and berries. The team found that the plant pigments are good at absorbing sunlight. According to a study, published in the Journal of Photovoltaics, plant pigments are naturally occurring biodegradable and nontoxic molecules that are extracted using techniques that involve negligible cost to the environment and therefore can provide eco-friendly alternatives to synthetic dyes that are used for thin film solar cells production. The researchers at IIT-Roorkee extracted the plant pigments using ethanol to create the thin film solar cells. And while the organic thin film solar cells are not yet as efficient as conventional silicon-based solar cells, the team is investigating ways to make them more efficient and cost-effective. Read the full report by Lorraine Chow. About 9.86 crore people (8%) in India suffer from sinusitis, according to the Government of India’s Union Ministry of Health and Family Welfare. Of these, for the chronic cases who do not benefit from medication, a team of researchers at InnAccel, Bangalore, has developed a device called SinuCare to provide long-term relief within a day. Sinusitis is a condition in which the openings of the sinuses (the cavities in the bones in our forehead, cheeks, and the nose which form the respiratory tract from the nose into the throat) swell and clog the airflow inside them. The inflammation (swelling and redness) is caused due to infection, allergies, air pollution, or structural issues in the nose. Some of the common symptoms of sinusitis are thick nasal mucus, a plugged nose, pain in the face, fever, headaches, poor sense of smell, sore throat, and/or cough. In most cases, sinusitis can be treated by medication. However, it is considered as a chronic case if the condition continues beyond three months. To chronic sinusitis patients who fail to benefit from medicines, doctors usually suggest functional endoscopic sinus surgery (FESS) to widen the sinus openings, clear any collected secretions, and to ventilate the sinuses and the nasal cavity. However, FESS is not only an expensive procedure, but is also quite invasive, as it requires surgical removal of many bony structures within the nasal cavity. It, therefore, carries a higher risk of complications and over-ventilation of the sinuses which can hamper its normal functioning. As per a survey conducted by the InnAccel team, of the total number of sinusitis patients who visit an ENT doctor, on an average nearly 45 percent are counseled for FESS. However, most patients choose to try alternative forms of healing and avoid surgery till the extent it becomes essential. Two major reasons for this that emerged from the survey are: the cost (in India FESS cost ranges from Rs. 60,000 to Rs. 130,000) and the fear of complications or physical damage due to the operation under general anesthesia. SinuCare is a minimally-invasive balloon sinuplasty device meant primarily to provide chronic sinusitis cases a cost-effective and safer alternative to FESS. “With SinuCare we have tried to alleviate the concerns of chronic sinusitis patients. SinuCare is a simple metal device that uses a disposable double-balloon dilator, which is inserted into the blocked sinus openings through the nose. When the double-balloon dilator is inflated with saline in the blocked cavity, it expands and remodels the sinus openings, clearing the respiratory cavities by causing tiny bone fractures. Unlike FESS, balloon sinuplasty using SinuCare does not require any tissue removal, thus decreasing the risk of complications that arise from excessive removal of bony tissue and reducing the time for recovery. Moreover, an ENT doctor can operate SinuCare in his or her clinic, thereby reducing the cost of hospitalization for the patient,” explains Dr. Jagdish Chaturvedi, 33, who is a co-inventor of SinuCare. Dr. Chaturvedi is an ENT specialist in Bangalore. In 2016, he won the MIT Technology Review’s TR35 Award for Young Innovators under 35 for one of his medical device innovations. At InnAccel, he develops new medical devices with cross-disciplinary teams and mentors young researchers and professionals in their entrepreneurial endeavors. He is now conducting awareness sessions for ENT doctors on the use and benefits of SinuCare. “We have trained over a 100 ENT surgeons across the country and some of these doctors have started counseling and treating patients with SinuCare and the feedback from them and the patients has been very satisfying. I am also travelling to various cities to perform surgeries and train doctors on how to use SinuCare,” he adds. (L-R) Dr. Jagdish Chaturvedi gives SinuCare training to ENT doctors on a 3D model of the sinuses. 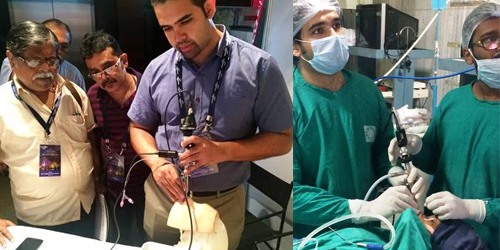 On the right, he is conducting double-balloon sinuplasty using SinuCare on a patient in Kolkata. The InnAccel team has filed a patent in India for SinuCare. They have also applied for the CE (European Union) quality certification for the device. SinuCare comprises a navigation system through which the doctor manually inserts a soft polymer double-balloon dilator into the nose, to unclog the openings of blocked sinuses. When the double-balloon dilator reaches the target, the doctor infuses the balloons with saline at 12 atmospheric pressure with the help of a pressure pump. As the balloons expand to their maximum diameter of six millimeters, they remodel the sinus opening and allow the mucus to drain out from the cavity, giving way to better ventilation. Finally, the dilator is removed and the device is pulled out of the patient’s nasal cavity. The procedure is repeated for each blocked sinus. Following the complete procedure, the doctor keeps the patient under observation for an hour as a precautionary step to watch for any bleeding or dizziness. It takes about four to five hours for the entire procedure to complete, from the time the patient is given anesthesia to the clearing of the sinuses to when the patient is advised to go. Unlike existing balloon sinuplasty devices which use a guidewire for inserting the balloon dilator into the nose till it reaches a clogged cavity, SinuCare has provisioned for ENT doctors to mount their endoscopic camera for a clear view of the sinuses and blockages. A guidewire is a polymer wire that is put alongside/inside the dilator to allow the doctor to feel the sinus blockage. However, it increases the cost of the device, the number of components it comprises, and the skill requirement to carry out the procedure. The other key different feature of SinuCare is that its guiding system is a reusable product. The double-balloon dilator is the only disposable material in SinuCare whereas other sinuplasty devices are completely disposable. Without the dilator, SinuCare can be completely sterilized for reuse, enabling reduction of the total cost of the device for the doctors as well as that of the overall treatment. Currently, SinuCare is being recommended and used by co-inventor Dr. Sunil Narayan Dutt, world renowned Otolaryngologist and Head of ENT at Apollo Hospitals, Bangalore and by Dr. P.S. Pradeep Kumar, Founder and Medical Director, Meenakshi ENT Specialty Hospital, Bangalore. They have been contributing feedback in the making of SinuCare. 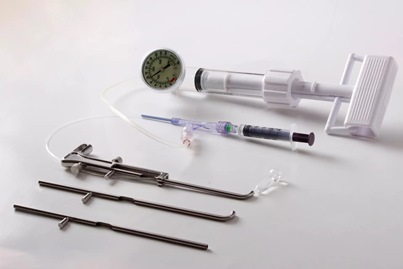 The product is being packaged as a kit that comprises the main device, three dilators, and a pressure pump. SinuCare kit is priced at approximately Rs. 30,000 for the ENT doctors, and the treatment cost ranges between Rs. 40,000 and Rs. 60,000. While the guiding system of SinuCare has been designed and manufactured in India, the disposable double-balloon dilator for it, also designed in India, is being contract manufactured by Surmodics in Ireland. “We want Indian manufacturers to come forward and create good quality products for us. Under the government’s Make in India initiative, we are trying to manufacture devices in India – one for giving business within the country and second to minimize the cost. The manufacturing scope is big in the field of medical devices. However, we are yet to see innovative manufacturers who are willing to work with a development team, experiment with business models and to give the same quality as foreign suppliers,” says Pooja Kadambi, the team’s lead engineer and co-inventor who has significantly contributed in designing and manufacturing of SinuCare. ENT doctors, patients with chronic sinusitis, and manufacturers can write to Dr. Jagdish Chaturvedi at jagdishc@innaccel.com or call 080-40923864. Bangalore-based Aditya Agarwal (23) has created a coin-sized micro-USB powered 1.2 watt white LED bulb, called Bulbh, that emits twice the light than a one watt compact fluorescent light (CFL) bulb. Created and designed at Aditya’s startup My Dream Bird, the Bulbh is a small, slim, micro-USB powered light that has a light emitting capacity of 120-130 lumens as compared to 60 lumens per watt of a CFL and 12-17 lumens per watt of an incandescent lamp. It can be used as an emergency light, a cycle light, night light, in wardrobes, for photography, or as a helmet light. This September Aditya plans to launch Bulbh in a ‘buy one, donate one’ model where every Bulbh that is sold online, one unit will get donated in India to the communities that are still using incandescent bulbs to reduce their cost of living. The traditional incandescent yellow light bulbs are much less efficient than other types of electric lighting; they use less than five percent of energy into visible light, converting the rest into heat. Though the manufacturing cost of incandescent bulbs is less, its low light emitting capacity and high power consumption factors have led the European Union, China, Canada and United States to consider phasing it out. India too is slowly moving towards banishing the incandescent bulbs. As incandescent lamps phase out, light-emitting diodes (LEDs) that are being assembled into a light bulb. Like incandescent lamps, and unlike CFL lamps, LEDs come to full brightness without the need for a warm-up time. They have a lifespan and electrical efficiency that is significantly better than the rest. The LED lamp market is projected to grow multi-fold over the next decade, to $25 billion by 2023 (see source). Aditya’s Bulbh taps into this emerging market. Speaking of the micro-USB powered light, he says, “The Bulbh can be powered by any micro-USB chord that can be connected to a power source such as a mobile device adapter, a power bank, a personal computer or a laptop. It has been ergonomically designed for use in various conditions and emits bright light. It is specifically targeted for mobile phone users of the world who already have micro-USB adapters.” This is a large user base. According to a report, the number of mobile phone users in the world is likely to reach almost 5.3 billion by 2017. To make Bulbh emit light uniformly in all directions, the product has been given a custom casing of silicon and thermoplastic alloy. The casing also prevents Bulbh from heating up, even after 24 hours of continuous use. A tiny circuit of LEDs lies inside the enclosure. To achieve the color rendering index (CRI) of 80, which is equivalent to any CFL, and twice the lumens per watt than a CFL, Aditya has created Bulbh by using six 0.2 watt Everlight LEDs, each with a capacity of emitting 24 lumens of light. All LEDs have been placed in a series on an aluminum-core printed circuit board that maintains the circuit temperature uniformly. The circuit comprises a dedicated high-frequency DC-DC converter that operates as a constant-current source. There is provision for high switching frequency that regulates the amount of inrush current and prepares the circuit for a soft start. This also prevents the circuit from over-voltage, short-circuit and over-temperature incidents. On the outside, each Bulbh is fitted with a neodymium magnetic base so that the users can stick it on any metal surface. Initially, My Dream Bird plans to provide two extra magnetic stickers with the product so users can stick it to metal, stone wall, wood, ceramic or glass. With its coin-sized smooth form factor, Bulbh looks sleek. The tiny lamp, with a rounded shape similar to that of an Indian sweet called ‘batasha’, is just 0.6 inches in height and 1.3 inches in width, and weighs between 30-35 grams. As Bulbh finds its users in the market, Aditya plans to execute his ‘buy one, donate one’ campaign simultaneously. “The idea of donating Bulbh occurred to me when I saw hawkers in Kolkata selling their goods under candle light. I found out that they do not buy incandescent bulbs or CFLs as they get heated up and they cannot afford LED lights. Hence, for each Bulbh that is sold online, I plan to donate one to such communities and users in India,” explains Aditya. Initially, he plans to sell Bulbh through popular e-commerce channels in the U.S. and the European Union countries. My Dream Bird has collaborated with non-governmental organizations such as Goonj, Smile Foundation, Round Table India, and HelpAge India to ensure donated Bulbh lamps reach hawkers, students, underprivileged children and the elderly communities in India. Bulbh will be launched in the U.S. and European markets by September 2015. Once he is able to raise $400,000 funding, Aditya plans to open-source the project. For more details, contact Aditya at aa@mydreambird.com or visit the Bulbh website. In an attempt to give an innovative twist to the age-old spinning wheel (charkha), students at the MIT Media Lab India Design Innovation Workshop have created a prototype that can color the yarn on the fly! The project, Colored Yarn, has been created to provide technology advantage to the weaver community of India. Charkha is one of the oldest known forms of the spinning wheel. It works with a drive wheel being turned by hand, while the yarn is spun off the tip of the spindle. It is a small, portable, hand-cranked wheel that is ideal for spinning cotton and other fine fibers. Mostly, the charkha is used for spinning cotton and the hand spun cloth is called Khadi in the Indian peninsula. According to the Handloom Census of India 2009-10, India has about 29 lakh handloom workforce working on 23.77 lakh looms across household and non-household handloom units. About seven percent of the 20.91 lakh working household looms continue to use the hand spun yarn, supporting the Khadi programme. The most extensive use has been observed in Tamil Nadu and Karnataka where 30.1 percent and 24.4 percent looms operate with hand spun yarn, respectively. It is for the community of weavers who provide hand spun yarn for the looms that the young innovators wanted to change the traditional way the charkha works. Attendra Sharma (20) of the Institute of Hotel Management, Gandhinagar along with Monica J. (21) of PESIT University, Bangalore, and Lavanya Gupta (20) of Dhirubhai Ambani Institute of Information and Communication Technology, Gandhinagar, have developed an innovative prototype of the charkha that allows for the yarn to be colored on the fly. The trio developed the project as part of the ‘Sensors Across Scale’ track at the 2015 MIT Media Lab India Design Innovation Workshop that was held in Gandhinagar, Gujarat, in January. While the track focused on building new sensor systems working across scales, it also encouraged innovations that “affect human relationships and social problems”. The 2GB team (two girls and a boy), as they called it, focused on innovating with the spinning wheel not with the sensors but by using basic components such as the box charkha, a pulley, a coloring unit, and a spool. A tightly rolled tube of cotton, called pooni, is one of the ways to fine and even spinning. Weavers can make poonis from pre-carded cotton by laying a thin layer of cotton on a flat surface and rolling it around a thin stick and compressing it with hands. For proper tension, the spindle support post must be positioned far enough so that the spindle drive cord holds it vertical. Also, the post base should be angled so that, when the spindle is spinning freely, its pulley rotates midway between the post arms, not touching either one. For the first time, a leader is added to each spindle to help start the spinning process. The drive wheels turn together smoothly and the tension of the thread gets adjusted by moving the small wheel. The 2GB team introduced a coloring unit as an attachment to the briefcase charkha. As a spinner spins, the plain thread passes through the unit where color is dropped on the thread through a funnel, producing a clean, dry, dyed hand spun yarn. “This is a new and unique use of technology on a traditional product. The process of spinning the yarn and then dyeing it in a color of choice is a five-day process. Our prototype not only allows the weavers to color the yarn within a few seconds, but also provides them the freedom to experiment with different colors of their choice for the hand spun fabric, without much dependency on the dyeing process. By making minimal changes in the charkha, we have tried to retain the authenticity of the product and yet modernize it enough to save the art,” said Lavanya and Attendra who conceptualized and engineered the prototype. The team plans to improve upon the design and function of the coloring unit to create a final product. To know more about the Colored Yarn prototype, write to lavanya181194@gmail.com or attendra.ihma@gmail.com. At the 2015 MIT Design Innovation workshop, a MIT Media Lab India initiative, a group of students and professionals has created a mobile application called Blood Collective that allows those in need of blood to search for voluntary blood donors available in the vicinity. The team developed the application prototype at the 2015 MIT Design Innovation Workshop in Gandhinagar as part of the Civic Innovation track which focused on building “the tools that help change the world together”and “a better technological infrastructure to support the engaged citizens who are already acting to make their communities better, and inspire others to join them”. Combining different skills, each team member contributed differently to create the alpha version of the app and test it during the workshop. While IT industry professional Pragnendra Rahevar (32) floated the idea and shared the concept, National Institute of Design graduate Akshah Ish (27) designed the complete user interface of the application. The core development of the app has been done by Ayush Sharma (20) of Arya College of Engineering and IT, Jaipur, with necessary research and support provided by Abhimanyu Kumar (20) of Haldia Institute of Technology, West Bengal. Voluntary blood donation is considered the highest form of humanitarian service as it is done without the expectation of knowing who it will eventually help. Each unit of blood donation helps many patients as blood is usually segregated into RBCs, Platelets, WBCs and Plasma and given away as per requirement. But then there are yet not enough people who opt to donate blood. In India there is constant shortage of blood. According to a 2012 World Health Organization (WHO), every country needs at least a one percent blood reserve. India, with its 1.2 billion population, needs 12 million units of blood annually but collects only nine million of which 70 percent is from voluntary blood donors while the remaining 30 percent is from family/replacement donors. Even though most blood collection is done from voluntary donors, the voluntary blood donors network remains fragmented and inaccessible to a large community at the time of need. The Blood Collective smartphone application aims to tap into this existing network of blood donors and bring them at your fingertips. “In India it is just a chance that you will get blood when you need it. Some people do not want to donate blood, while some who are willing to do it find it frustrating to go to the blood banks criteria, fill forms and donate. Tapping into the community of voluntary blood donors therefore remains a challenge. 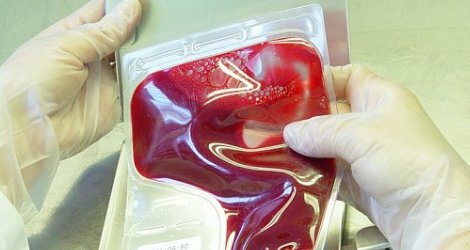 The current gap between the demand for blood and its supply also leaves scope for touts, agents and illegal, unsafe blood donation. Paid blood donation is illegal in India. Our application targets the problem in a simple manner – if you need blood, connect directly with multiple blood donors close by and see if any of them is willing to offer help,” explains Ayush. During the workshop the alpha version of the Indian-centric app was hosted on local servers and directly uploaded to a few mobile phones. However, based on the feedback from mentors and users, with the help of a few volunteers the team is now developing the beta version of the app. The app is expected to function like this: The first time the user accesses the application, she will be requested to select from the two categories “I want blood” or “I want to volunteer”. Once a voluntary blood donor selects the latter option, her name and number gets registered in the database. However, for safety reasons, the name and number of the donor is not shared with the requester. Rather, when the requester searches for a donor in the vicinity, she can view profile icons of the available donors and can send a request to them through the app. The requester’s number is sent to the donor and the decision to respond entirely rests with the donor. The volunteer category also enables the voluntary blood donors to see all requests, allowing the user to contact the requester directly and offer blood donation. “The most important aspect of the app is to generate awareness about safety of blood donation and encourage volunteering. Currently, whenever people need blood, they either opt to call, send SMS or post on social networking websites. The wait for a response is stressful. At blood banks, if you have donated blood in past six months, you may be charged around Rs. 1,400 per unit. If you haven’t, the chances of getting blood are dismal. The solution to all this is volunteered blood donation. Bringing volunteer blood donors closer to the needy therefore could be very helpful and that is the focus of the Blood Collective app. Using the app, both a volunteer and a requester can save lives,” explains Pragnendra who has been volunteering with a non-profit organization for over three years, organizing blood donation camps across the country. The team is developing the beta version of the app and improving its user interface, adding more features to it, and carrying out basic user testing. It is expected to be available on the Web and on Google Play store by May 2015. The group is looking for more volunteers with specialized skills to develop the application for the iOS and Windows platforms. The Blood Collective mobile app has a huge social potential to connect and build a large network of voluntary blood donors with the requesters, allowing the common man to save lives and be human. However, it needs to build on its unique aspects that will differentiate it from the existing apps. To know more about Blood Collective, contact pragnendra@gmail.com. Enter your email address to subscribe to this blog's new posts by Email.